"Family recipe cards are about our culture, our roots, our history." If you are someone who would grab your old recipe box before running out the door in a fire, you are not alone. 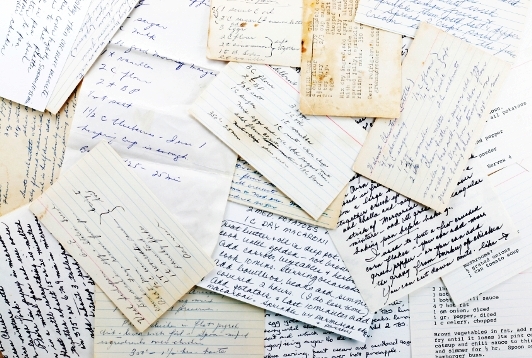 Many of us, own historic family recipe cards with abuelita's writing or stained with salsa. They are important link to our past, one that deserves to be preserved for our future. When the stock market crashed in 1929 it ushered in a new era of hardship that meant home cooks had to get creative and learn how to stretch their food dollars. For most families, meat was the most expensive, and hard to get, grocery item. Recipe cards helped make food go further were at the front of recipe boxes. Hearty, filling one pot soups and stews that used flavorful (but inexpensive) vegetables and beans as a substitute for meat, were popular. But back in the day, neighbors will share their recipes cards with one another and help improve or add a little something extra to make the dish EXCELENTE! These days, you might turn to websites, blogs or TV celebs for answers. 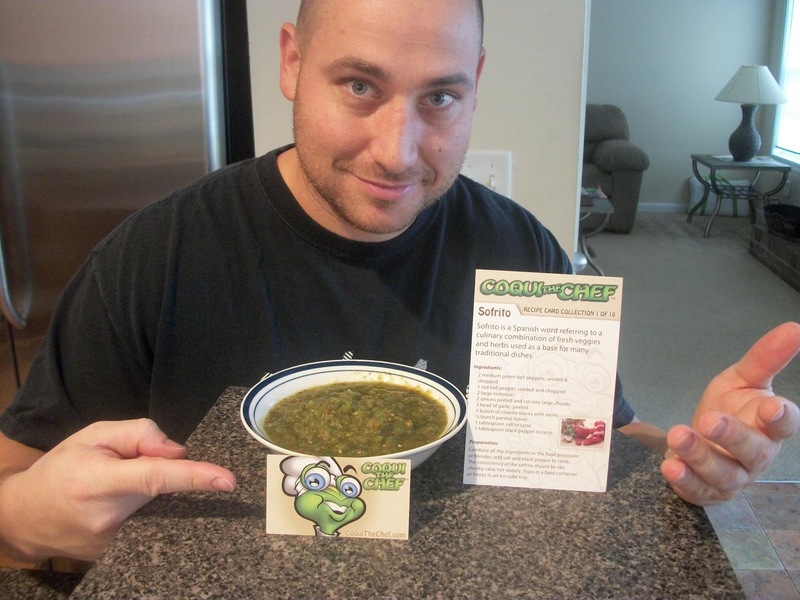 In an effort to bring back people's love for cooking we published Coqui the Chef's limited edition recipe cards. 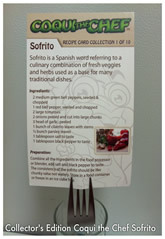 The first in series is "Sofrito" just like abuelita used to make (except with all the doodling and food stains) Choose all organic ingredients RICO!! Start or add to your collection today. Free shipping. On occasion we announce the TOP 8 Fans who interacted the most on Coqui the Chef Facebook page. The first on the list was Victor Rodriguez from Vic's Nutrition and Fitness, as a token of our appreciation we sent him few gifts Coqui the Chef's recipe card "Sofrito" and some other goodies. there was a flour recipe that my abuela taught me to make that could be dipped in beans, soups, or stew. The only thing wrong with the recipe is that she used manteca. I learned to us olive oil for all my frying needs and smart balance butter. it is always good to modify recipes according to your dietary needs. It is true, we usually forget that beans are a good substitute for meat. Too many people don't know that!